I wrote ‘Genbu’. It means Black Tortoise in English. It is one of the four gods said to rule over the four directions in China. ‘Genbu’ preside over the north, the winter and the mountain or the hill. It is shape of the tortoise sowed the snake. 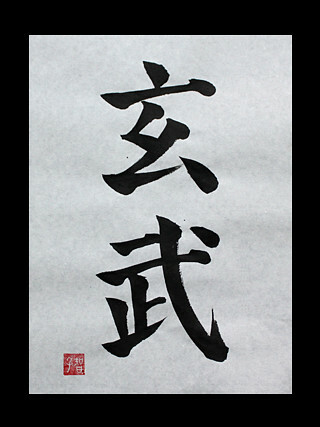 Often ‘Genbu’ appears in Japanese Managa and it is used in the names of the place, sword or others.